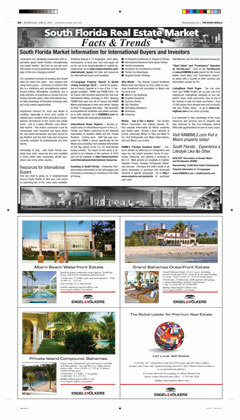 MIAMI features a weekly column in The Miami Herald International Edition, promoting Miami and the local real estate market to thousands of prospective buyers in Latin America and the Caribbean. MIAMI has negotiated a special offer with The Miami Herald International Edition that provides MIAMI members special pricing on advertisements appearing in the same section - 1/8 of a page ads are only $100 on Thursdays (minimum 6 time commitment). See additional pricing information below. For advertising information please contact Isabel Entenza at (305) 812-7740. There are several distinct market segments serviced by the International Edition. The two things they all have in common are that they speak English and are from A or B social economic groups. ¨ Highly affluent foreign nationals read The International Edition for its coverage of political, financial, economic, and cultural issues.